In an incredible show of hubris and idiocy Hispanic Chamber head Javier Palomarez has attacked Hillary Clinton for selecting Tim Kaine rather than a hispanic as Vice President. He suggests that this might be the reason the Trump received approximately 30% of the latino vote and ultimately tanked her candidacy. Palomarez was especially scathing about the decision to choose Tim Kaine, a senator from Virginia, as Clinton’s running mate, passing over the rising Hispanic star Julián Castro, currently housing secretary within the Obama administration. “I have to believe that if she had a Hispanic standing beside her she would have got more of the young vote, more of the Hispanic vote, and today she would be president-elect,” he said. I personally find this sort of critique both nauseating and a classic case of stupid identity politics. If hispanics refuse to coalesce against a candidate who is on record continually calling them thieves and rapists and threatening mass deportation while the other candidate has gone to bat for them at every opportunity and they still need a further sweetening of the pot before choosing, well they deserve what they have coming to them. May you awaken in the women's rest room of Trump headquarters to discover that you are a black Cuban transexual. How's that for a curse? Having taco trucks on every corner would be a great thing! 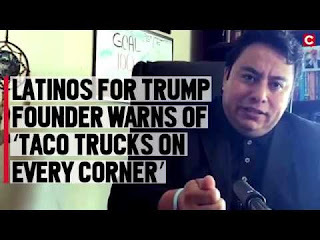 I agree I would love a couple of taco trucks up here,some of the best food in the world can be found by our neighbor to the south In alaska you will need to plug your trucks in at nite though! !